The Cleveland Pops Orchestra will be among the first to hold a major fundraising event at the brand new 32-story Hilton Cleveland which opened officially on June 1st. The Cleveland Pops 20th Anniversary Celebration will be held on Saturday, August 20, 2016, in the Hope Ballroom of the brand new eye-popping Hilton. This year, the orchestra has chosen its two founders—Carl Topilow and Shirley Morgenstern—as the honorees for the event. 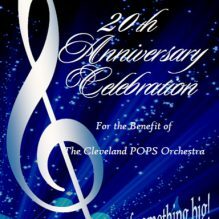 The Pops 20th Anniversary Celebration, formerly called the G-Clef Ball, is considered to be one of the most elegant of fundraisers held in Cleveland. This is the fourteenth such event for the orchestra, noteworthy for its distinctive silent auction and the entertainment and grand dance music provided by maestro Carl Topilow and the world-renowned Cleveland Pops. All proceeds from the 2016 fundraiser will benefit the non-profit Cleveland Pops Orchestra. What: Cleveland Pops Orchestra "20th Anniversary Celebration"
When: Saturday, August 20, 2016 ~ 6:00 p.m.
Reservations can be made online or by calling the Cleveland POPS Orchestra at (216) 765-7677.